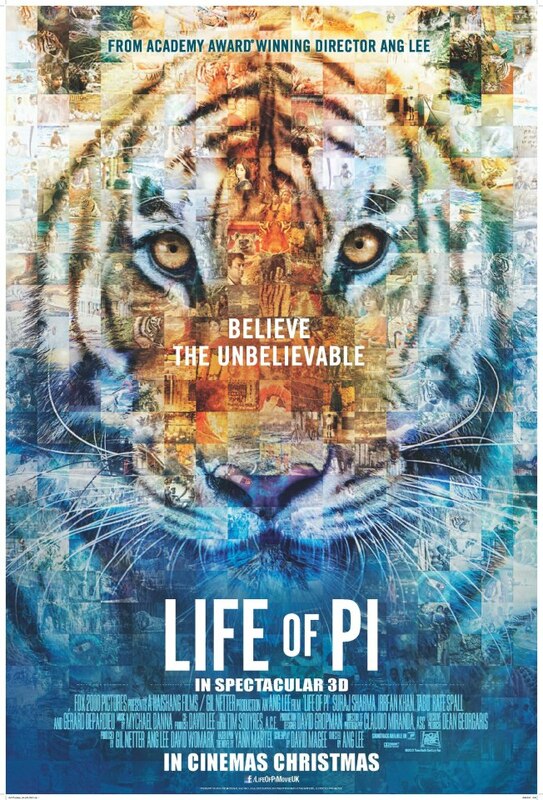 Life of Pi is based on a fantasy adventure novel written by Yann Martel. Conceptualizing this storyline and making a precise movie out of it is hard to imagine. In retrospect- the movie is more of a journey than a story. A grown up Pi (Irrfan Khan) reminisces about his tale. It begins with a young Piscine Molitor Patel, (Ayush Tandon) and how he spent his youth in Pondicherry. Unworldly and innocent, he is often the subject of ridicule of his peers. Although his parents (Adil Hussain and Tabu) raise him as a Hindu, he learns to embrace three religions, much to the incredulity of his father. Throughout the movie, his faith in God and the belief that he will protect him remains unnervingly steady. Lush French Quarters of Pondicherry, the time spent in school, the times Pi spends in his and a couple of shy moments with Anandi, a dancer, comprises his childhood and the actual happy parts of the movie. Eventually, his family decides to start a new life in Canada because of political unrest in British India. Pi (now portrayed by Suraj Sharma) and his family embark on a journey by ship, along with some animals from their zoo. Tragically, just after a few days, the ship meets a storm and capsizes. In minutes, the atmosphere in the theatre changes from lackadaisical to anxious. Pi manages to hop onto a lifeboat, but knows nothing of the fates of his mother, father and brother although it is certain they have drowned and died. After the storm, Pi regains consciousness on his small lifeboat. But he is not alone. In this bizarre turn of events, throw in an injured zebra, a hungry hyena and an orangutan, all trying to survive on that small lifeboat. In the process, the hyena kills both the orangutan and the zebra; and just when you think that there can’t be any more animals, from under the tarpaulin emerges ferocious Richard Parker: a hungry adult Bengal Tiger who, of course, kills the hyena. Frightened, Pi constructs a small raft using flotation devices and tethers it to the lifeboat. So begins his agonizingly long struggle for survival, with no one but a hungry tiger to keep him company and a few pages of paper for him to vent his thoughts. He manages to catch some fish and regularly feeds Richard Parker. But soon, the tiger begins to accept Pi’s presence on the boat and a cautious relationship develops between them. While adrift, Pi discovers an island inhabited by carnivorous algae and meercats. But even on a perilous island, far away from any human being, Pi never loses hope. After 227 days, he washes up on the shore of Mexico with Richard Parker in tow. Pi collapses, on the sand, exhausted, but Richard Parker simply walks out of the boat, without a backward glance at his sole companion, which hurts Pi more than he would have thought. Through this movie, Pi has you convinced that you can survive the worst if you have faith in God. It is definitely over hyped as far as the story is concerned. The story-line is slow, but gripping. In terms of animation, the movie is a visual delight, thanks to the director, Ang Lee. It transcends all limits of cinematography. The cast have certainly showcased their skills. It depicts brilliant scenes of the ocean in its many moods. Life of Pi makes you want to believe in what logic tells you is impossible. It makes you want to sympathise with a character that is fictional. It is a journey you will want to make, albeit knowing you never will. How this movie manages to remain unreal yet surreal, is a mystery in itself. And believe me- your favourite animal after watching this movie will be the Bengal Tiger…for a long time. Skyline is the official Bi-monthly newsletter of SIES College of Arts, Science and Commerce, Sion(w). Here at Skyline, we strive to be an example for those students who wish to take a step forward and showcase their talent. We also offer yearly internships. This blog in particular has been made for those students whose skills call for special recognition.